Who is it for? Nivea Happy Time Body Lotion is for those who are looking for a moisturizing body lotion that smells citrusy. Apply lotion gently all over the body, with special attention to dry areas, slowly massaging it in. Best used after bathing when your skin is most receptive to hydration. 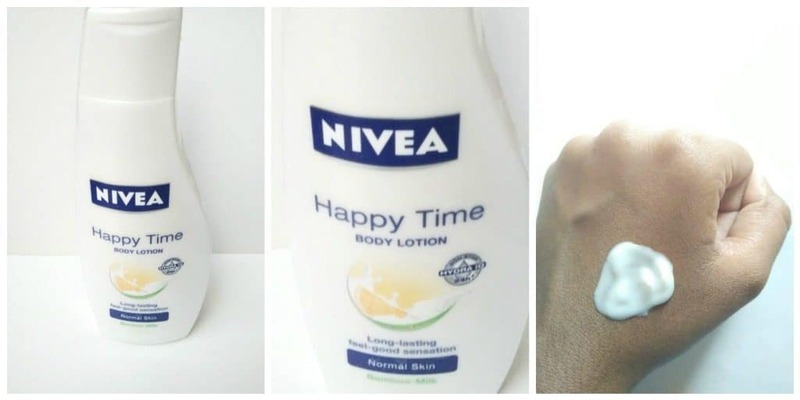 Nivea Happy Time Body Lotion comes is white colored sturdy plastic bottle with a flip-top cap. The packaging is travel-friendly. The body lotion is white in color and the texture of the body lotion is smooth and has a runny consistency which makes body lotion easily absorbable. The body lotion has a refreshing fruity smell with a hint of citric scent. Nivea Happy Time Body Lotion hydrates and refreshes skin without leaving it sticky. It leaves skin feeling young, smooth. Enriched with soothing bamboo extracts, it repairs and protects skin. Deeply moisturizes layer by layer removing all signs of dryness. Gently soothes irritated and sun-exposed skin providing instant relief. It leaves skin soft and smooth and its lemony fragrance keeps you fresh all day long. It doesn’t make skin oily or greasy. It makes skin very soft and keeps skin nourished for quite long that is around 9-10 hours easily. This body lotion is good to massage on hand and legs. Nivea lotions are extremely mild and gentle and are suitable for daily use. Yes, this lotion is highly recommended as the lotions from Nivea are very gentle and have a pleasant, soothing fragrance.